The following advice comes from friend of STAA, Matt Dumouchelle. If possible, get a game tape or audio from the team to get comfortable with their lineups. Coaches will change lines open during games, but as an example, the #1 and #2 power play and penalty kill units normally stay the same. If you can nail down those units it will make a difference during the game. If you are doing pregame interviews for your broadcast, that is the perfect time. Record your conversation and then ask afterwards who he likes playing together, if he matches up lines etc. Some coaches will be hesitant to divulge that information, but even knowing #12’s line will always be out against #97’s line, it’s something you can watch for. The best time to nail down the rosters for each team is in warmups. All players are on the ice, it’s moving fast and it keeps your eyes active. Every time you read a number, say the name, even do a quick line or two of what he’s doing when you notice him. You can also use this time to pick up intricacies about the player (skating style, appearance – long hair, tucked in jersey etc). Just like any sport, you will always have people popping in and out of your broadcast. Giving the time of the period should almost be done every other whistle. Give the score every 3-4 whistles. 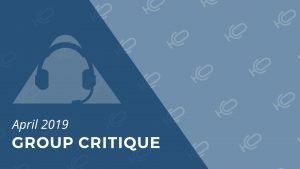 You don’t want to be overloading the game with only time and score because there are several things you would miss out on (being more detailed with who scored the goals, shots, sponsor reads) but those are the two biggest pieces of information the listener always wants to know. Hockey is a fast paced sport and has many up and down moments in a short period of time. The one thing I always key in on is not to sound too hyped all the time. A shot on goal from the blue line is seen and saved easily does not have the same emphasis as a shot on the power play through traffic that hits the goalie and slides behind him. If you try to make every scoring chance or shot sound like a Game 7 winner, you will tire yourself out and the listener. Referees can be blamed for pretty much every game a team loses. Missed calls, calls that shouldn’t have been made, waved off goals – countless things. It is not your job to decide if they made the right call or not. You are the communicator and instrument for the listener, you aren’t a fan or a coach. Describe the call, announce the power play is coming for whatever team and prepare to call the game, as much as humanly possible leave your opinion of the call to yourself. Don’t do this to the point that it takes away or distracts from your broadcast but if you see #12 out against #97 all the time, make a note of it to help keep track of who is on the ice. One of the more chaotic times of a game is at a whistle when both teams switch lines, that’s 10 skaters off and 10 skaters on without much time to see who is who. If you can identify which center is coming on the ice for each team, in most cases you will be able to identify who the wingers will be. In live action, you can easily get caught missing a line change or penalty behind the play if you are only focused on the puck. Perfect example, if the puck is dumped in at the red line, be more concerned about who is coming on and off the ice at that moment than the puck being collected behind the net. It will only be a few seconds but just as the team with the puck regroups, you can take that time to regroup and identify who is on the ice. There is an incredible Google image of New Jersey Devils announcer Mike Emrick using 153 different verbs to describe how the puck is moved in a game. If you use a fifth of that your game will sound clean and exciting. 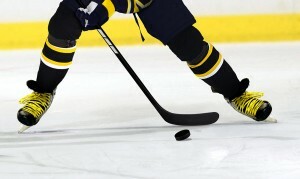 The puck isn’t always shot, it’s angled, blasted, tapped, sent, slipped and swatted. Esports is a rapidly growing section of the broadcasting industry. The following advice comes from an industry insider who prefers to remain anonymous. Do you love broadcasting sports and playing video games? Esports may be a perfect gig for you to explore. 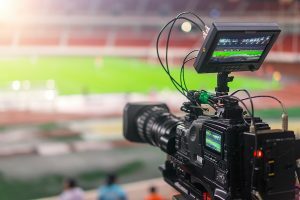 Esports broadcasts have been embraced by not only major networks like Turner Sports, Disney, and others, but virtually every tech company as well. 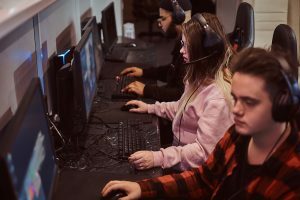 Even pro sports leagues are offering Esports divisions to connect more with millennials. Find matches to broadcast online and stay with what you know! Much like calling traditional sports, Esports requires a certain skill set. Knowledge of the video game being played is a must. Look around your area to see who is hosting large competitions. Research to find the platforms upon which the competitions are being broadcast. Another Twitch note is that they are moving into live sports programming with the addition of NBA G-League broadcasts, among others.